Once upon a time there was a girl named Dustylocks. She was given the unfortunate nickname by her parents, because her skin was so super dry. Dustylocks searched high and low for something that would quench her dull, dry skin. She was never sucessful but refused to give up hope. That would mean she would have to come to terms with her parched dermis and go through the rest of her life uncomfortable. She wasn't ready to give up. So she made it her life's mission to overcome her skin issues. 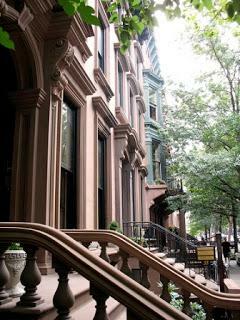 One day while pursuing the shops on Main Street, Dustylocks came across a beautiful brownstone home whose front door was wide open. She called "Hello" but did not hear anyone call back. 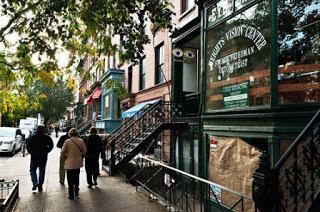 After a moment of silent standing, her curiosity got the better of her, and she stepped inside the home. After walking through the door, she found herself in the prettiest home she had ever been in. It was decorated lavishly with comfy overstuffed furinture placed in each of the rooms, and fragrant, fresh flowers sat on every surface. 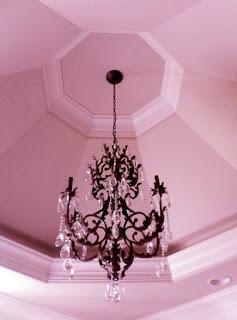 The walls were painted a soft pink and crystal chandeliers hung from the ceilings. There was no doubt that this house was occupied by ultra-feminine girly girls. Dustylocks walked up the stairs and explored the extravagant bedrooms. The beds were all simply made in luxiourious fabrics and soothing colors. 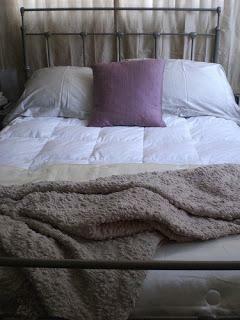 Each bed was topped with the softest, fluffiest down comforters. Dustylocks ran her finger across the top of the bed and longed to lay down in one. She fought the urge and continued walking down the hall. At the end of the hallway, she was faced elaborate glass french doors. Beyond the doors was the largest bathroom she had ever seen. She opened the doors and entered the room. The brightly lit space contained walls of glass shelving that held every beauty potion, cosmetic and fragrance imaginable. The area around the jumbo sized bathtub was lined with candles and bubble baths. The only area that was not overflowing with beauty products was the sink area. 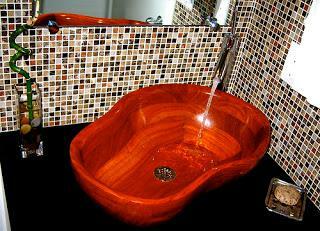 The wall was lined with three beautiful bowl sinks. Each sink was different, and next to each sink was a monogrammed bath towel hanging on the wall. On top of each sink sat two products. A body scrub and body moisturizer. She skipped over to the first sink excited to start testing. The towel that was hung next to the first sink was monogrammed with the letter "B". Dustylocks turned on the sink's tap and dampened her arm. She picked up the tub of body scrub, squeezed some out and started to massage into her skin. "Yowouch"! she shrieked. This scrub was too rough! And the salt formulation burned her skin. She quickly rinsed the awful scrub off her arm, toweled off, and picked up the tube of body lotion. She really hoped what the tube contained would soothe her irritated skin. She slathered the lotion on and was disappointed in the lotions light texture. It did nothing to hydrate or soothe her skin. Dustylocks shook it off and walked over to the second sink. The monogrammed towel next to this sink was also emblazened with a letter "B", and she started to ponder what the initials could mean. 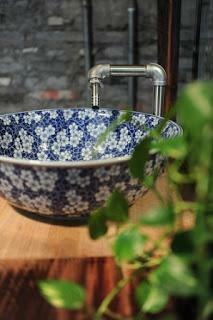 She hesitantly picked up the fancy glass jar from it's place on the sink and unscrewed the top. It smelled heavenly. Lavender and Vanilla, soothing, relaxing and beautiful. As she scooped a small amount out of the tub, she noticed that about half of the container was filled with oil. Strange that a body scrub's formula would consist of half oil. Dustylocks again wet her arm and started applying the scrub. This scrub was too oily! She couldn't feel the scrubby bits working and the slippery scrub left a gross, thick layer of oil on her skin. She rinsed and rinsed and rinsed but could not rid her arm of the oil slick. 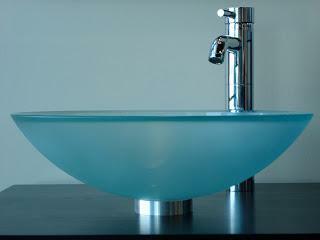 She shuddered when she thought about what this would do to the bottom of her bathtub. She could slip and fall! After drying her arm she picked up the bottle next to the scrub and read the label. This wasn't a body lotion! It was a body oil. No thank you, she thought. I have been lubed up enough for one day. Deflated, Dustylocks glanced over at the third sink. She debated whether or not she should try the potions on that sat on it's ledge. She felt like she had been through so much already. Her arm had been burned and irritated and had applied a ridiculous amount of oil to her skin. What on earth would the products on the last sink have in store for her? She decided to continue on. After all, she had come this far, why stop now? Dustylocks sauntered over to the last sink expecting to see a towel hanging next to it with a "B" emboidered on it. To her suprise, this towel was labeled with an "R" on it. She wondered what the letters meant. She looked at the sink and saw two plastic tubs of product. One was labeled "Scrubz" and the other was labeled "Butterz". 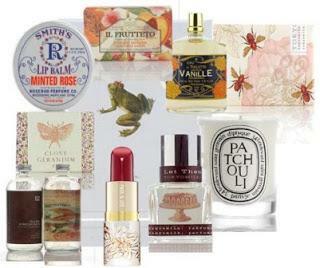 The products were scented with a Warm Vanilla fragrance. She opened the tub of Scrubz and inhaled. Ahhh....it was scented with the sweetest, warmest smell. Delicious cakes and cookies filled her head. She instantly felt comforted and applied some water to her arm. Before she applied the scrub she turned the product around to read the ingredients. 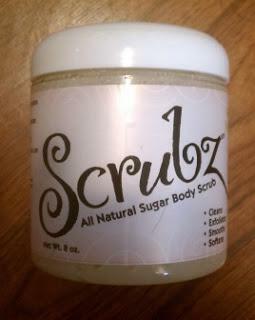 The scrub contains an eight oil blend, essential oils and refined sugar. This sounded perfect. All natural and there didn't seem to be any irritating ingredients. She was concerned about the oil though. 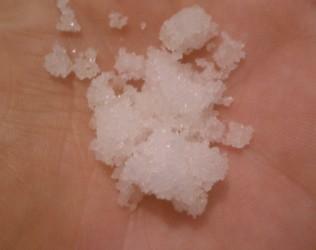 When she unscrewed the top, she saw no trace of oil, but what looked to her like a small tub of dry sugar. Amazing she thought, that this scrub contains an eight oil blend and I can't see any oil! She scooped out a small amount of the scrub and started rubbing it into her arm. The warm smell of vanilla surrounded her and the scrub felt amazing on her skin. Not to rough, not too oily. It was perfect. After she rinsed away the sugar, she felt her arm and was thrilled to see that Scrubz had left behind the perfect amount of oil. For the first time in her life her skin felt hydrated! She picked up the jar of Butterz, opened and took a large whiff of the yummy Warm Vanilla scent. 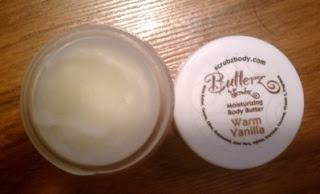 Dustylocks removed a tiny amount of the body butter and smoothed it onto her arm. The butter warmed when she rubbed it between her hands and moiturized her skin instantly. 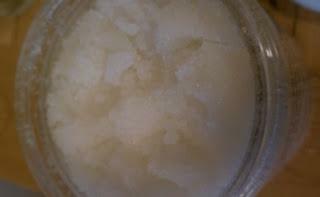 The whipped Shea Butter that is mixed with the eight oil blend absorbed quickly and she felt fantastic. Dustylocks fell head over heels in love with Scrubz and Butterz. In fact, she was so smitten, she decided that she needed to take a shower, right now, and treat her entire body to these effective hydrators. 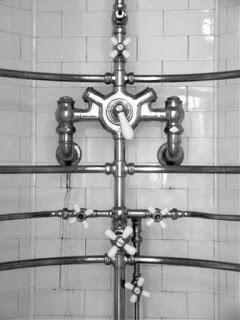 She marched over to the shower, turned on the faucet and six shower heads blasted out warm, steamy water. She grabbed the Scrubz, disrobed and stepped into the shower. She blissfully sloughed all of her dead skin woes away, right down the drain. Little did Dustylocks know that the occupants of the house came home. They walked into their house, set their designer bags down and stopped. They heard the shower running. But who could be in the shower? The three of them stood staring at each other. One of the occupants removed her spiky heel Yves St. Laurant Tribute Heel and motioned for the others to follow her up the stairs. As they were ascending the stairs, they heard the shower stop. Slowly they finished off the staircase and walked down the hall. When they reached the french doors they couldn't see through the steam that covered them. While holding the heel in her hand, Brownie threw open the doors. The three sisters walked into the bathroom and saw Dustylocks sitting on their poufy vanity stool in one of their bathrobes, applying a lotion. Dustylocks looked up and screamed, which caused the three sisters to scream. When Dustylocks stopped freaking out and actually looked at the three sisters that stood in front of her, she finally realized what the monogrammed towels meant. 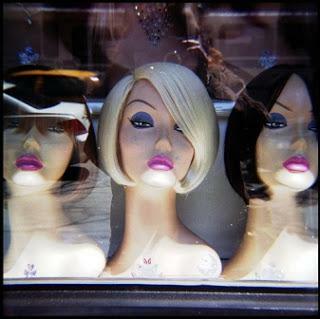 Standing in front of her were three gorgeous ladies, a blonde, a brunette and a red head. B, B and R. Duh. "Who are you and what are you doing in our home?" Blondie demanded. "Why are you wearing my bathrobe and using my Butterz?!" Red cried. "Okay look. Everyone calm down. I will return your bathrobe to where I found it. But the Butterz....the Butterz is going with me. And so is the Scrubz." Red went bananas. There was no way she was letting this crazy stranger waltz out of her house with her favorite bath and body products! She lunged after Dustylocks. Brownie caught Red mid-lunge and yelled "Stop! You don't have to attack her! Just write scrubzbodyscrub.com down on a piece of paper and tell her to buy her own"! So while Dustylocks returned Red's bathrobe to it's hook in the closet, and Red simmered down, Brownie searched around for scrap paper and a pen. Red turned to Dustylocks and said "The Scrubz and Butterz come in so many delicious scents that you may have a hard time choosing the right one". "Well maybe I will start my way at the top of the list and work my way down, right through every scent". Dustylocks replied. Brownie handed Dustylocks the piece of paper that had the Scrubz website scribbled on it and said "I think it is time for you to leave". Later that night, Dustylocks sat at her computer and thought about how hydrated her skin still was. The moisture that the Scruz and Butterz delivered had lasted all day! She logged onto her computer and typed in the website url that Brownie wrote down for her and smiled. She finally found what she had been searching so long for! And, in addition to the life saving body scrubs and butters, there was also a face scrub, lip balm, and various other products to purchase! Dustylocks was in heaven. That night, as she layed in bed, she touched her soft skin on her arm and thought it was time. Now she needed to change her nickname. From that day forward she decided that her name would be Glowinglocks. Because finally, she had healthy glowing skin. Fiction aside Scrubz is hands down one of the most effective and versitile body scubs I have ever used. The thing about Scrubz that brings me the most joy is shaving with it. That's right. I shave with it. And no, it is not irritating and it didn't make my legs break out in a nasty razor burn rash. Just smooth the scrub on, buff away then rinse. You will be left with a light layer of oil. Then, use the oil as "shaving cream". The first time I used Scrubz to shave, my husband actually commented on how smooth my legs are. I haven't heard that from him since we first started dating YEARS ago. Also, the company recommends it for use on your face. I felt weird about this but tried it anyway in the name of a well rounded review. (It's all for you sweet readers!) So, it was okay as a face scrub. I thought it was a bit harsh. The oil was nice though, and my face did feel moisturized afterwards, but not so moisturized that I felt like I didn't need to apply moisturizer afterwards. Butterz is awesome and a tub of this will last a long time. You only need the smallest amount since when you warm it up in your hands it spreads like, well....buttah. Seriously delightful. Check out this brand now. It is well worth your time and money! Also, I am dying to know....what is your favorite body scrub. I am kinda obsessed with scrubs of all kind so this is one of my favorite topics! Tell me! Tell me! Tell me! Scrubz Body Scrub and Butterz can be purchased at scrubzbodyscrub.com. Also, head over to Facebook and like their page.